After weeks of obsessive coverage — we’ve done our fair share — “Game of Thrones” begins its final season Sunday on HBO. 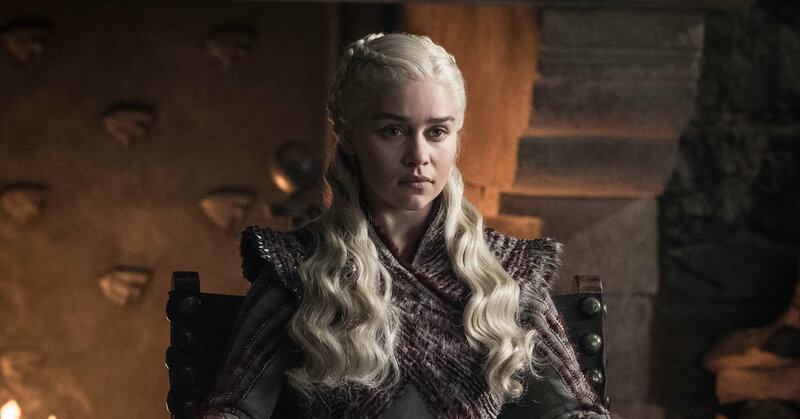 Earlier this week, Jeremy Egner, The Times’s TV editor and “Thrones” recapper; Jennifer Vineyard, who writes The Times’s “Thrones” newsletter; and Sopan Deb, a sports reporter (and former culture reporter) for The Times, talked about the show and its final season in a conference call with Times subscribers. This discussion has been adapted and edited from that conversation. (Subscriber questions are in italics.) Audio of the entire discussion is available here. SOPAN DEB Based on the trailers, a lot of action in Season 8 seems to take place at Winterfell. What do you make of that? JEREMY EGNER Well if you remember, the show itself starts at Winterfell — it started with King Robert’s arrival to come take Ned to King’s Landing. So there’s a certain symmetry to Daenerys’s and Jon Snow’s arrival that you see in the trailer. JENNIFER VINEYARD It sets up a little bit of how the structure of the entire series works. A lot of things are going to be repeating themselves, and I think that will continue to play out. We’re coming full circle in some ways. EGNER One of the pleasures of the show over the past couple seasons has been seeing all these really far-flung people come together, and either meet one another for the first time, or be reunited for the first time in years. At Winterfell, reunions are going to be happening all over the place. Arya is there, and Gendry and the Hound could be there. Jaime seems to be on his way, and Bran, who he once shoved out of a window, is already there. Dany’s also going to be there — and by the way, Jaime killed Dany’s dad. Jon Snow is presumably going to learn from Bran and Sam about how he’s the rightful heir. And Sansa doesn’t seem to be all that in love with the idea of bending the knee to Dany. So it could be a soap opera of reunion and recrimination. DEB Is there a story line that you’re particularly interested in? EGNER A big intriguing one I mentioned in an earlier season preview is: Will Dany break mad? I think it was Cersei who said “When a Targaryen is born, the gods flip a coin,” and obviously Dany’s father was murderous and insane. And we’ve seen both sides of that coin, so to speak, with Dany. She sees herself as a liberator, and she has tried to free and lift up the downtrodden, and she does seem to have a genuine concern for her people and her dragons. At the same time, we’ve also seen glimpses of cruelty, like when she torched the Tarlys. EGNER Yeah that’s hard on any new relationship, much less one that involves dragons. VINEYARD There’s a huge history of the Targaryens using dragons to fight battles with each other. And the show’s sound designer mentioned at one point that she had planned the sound for Viserion, when he is screeching, to be very different from the sound of Drogon and Rhaegal, because she wanted there to be a distinction, should you ever hear them fight each other. She was planning ahead for that for a reason. EGNER It’s kind of like Chekhov’s Gun: You don’t have a zombie ice dragon in the first act if you’re not going to use it by the third. So I think there’s definitely going to be a clash between the dragons, and, again, I’m leaning toward Daenerys going the way of her father to a certain degree, in which case the dragons become weapons. In which case, you have to figure there’s a lot of people looking to bring them down. Long story short: I know you’re in love with them, but I don’t have high hopes for their future. But I’m happy to be proved wrong. DEB Let’s talk about some characters. When we first met Cersei in Season 1, she seemed, if not loving, at least very protective of her children. But by the time Jaime turned his back on her last season, it seemed like she had been consumed. Is there any humanity left in Cersei at this point? VINEYARD I think that strain has always been there with her; she just never had the ability to do certain things. She was always trying to rule through her husband, or through her children, and now she’s finally having a chance to do what she wanted to do in the first place. She’s never actually cared about people other than her own immediate family. She only cares about the acquisition of power and being able to do whatever she wants. So it’s not that she’s lost her humanity — this is just her chance to actually express what she’s always wanted to do. EGNER It’s the purest expression of who she is and her values. That said, she has been a caring mother in her own twisted way, and there is the mystery of whether or not she is pregnant. Because she said that last season, but she’s also very calculating and it was something to use as leverage with Jaime and Tyrion. So that’s one of the questions that this season is going to have to answer pretty quickly: whether or not that’s even a legitimate thing. DEB How much do we really know about the Night King? VINEYARD He likes long walks on the beach, red wine. EGNER I’m pretty sure he’s a Scorpio. VINEYARD The problem with the Night King is he doesn’t talk. So he doesn’t tell us much about what he wants, or what he’s trying to do, at least not verbally — we can try to infer some things by the weird art installations he likes to leave behind. He does seems to always be prepared. And I don’t know if it’s just because he’s a greenseer and he can see the future the way Bran can, but when Dany came to rescue the people behind the Wall, he was ready with the right kind of ice spears to take down a dragon. VINEYARD Yeah did he go shopping beforehand? EGNER There was a Pep Boys on the other side of the mountain. VINEYARD So we can infer that he has some sort of psychic ability, but beyond that we don’t know a lot about him. EGNER That’s a theory that’s been going around, basically holding that it wasn’t Littlefinger who we saw get killed at the end of Season 7 — that he had perhaps paid off a Faceless Man to take his place and will be making a return appearance. That seems far-fetched to me but it’s gotten some traction, to the point that some gambling sites are including Littlefinger in their prop bets for who will eventually sit on the Iron Throne. VINEYARD It’s probably more likely that he didn’t do any of that, but Arya kept his face. Because if she ever wanted to sneak into, say, the Red Keep and get close to Cersei or someone in order to kill them, it might be helpful to not be herself. And Arya likes to hang onto faces, as we know. She’s got a whole bag of them. VINEYARD It’s so much easier than having to run back to Braavos to get fresh ones. DEB Of course the big question people talk about is who’s going to end up on the Iron Throne in the end? But does that actually miss the point of the show? VINEYARD I think it does. Because I don’t think this is a story about who is the rightful king and who should be on the throne. The whole idea of the story, in a way, is to critique those kinds of fantasy tropes. You have things like, in “Lord of the Rings,” where Aragorn has the right bloodline, and he’s a good man, and therefore he should be the ruler of the realm. But that doesn’t necessarily mean he knows how to rule. A lot of these story lines are about characters learning how to rule. That’s what Dany’s experience in Meereen is about. That’s what Jon’s experience at the Night’s Watch is about. That these people have to actually learn how to do things before they can become a ruler, and even so, should bloodlines and prophecies even matter? Maybe they don’t, and maybe this country is on the verge of actually adopting something beyond an absolute monarchy. Maybe this story is basically about the turning point in how Westeros got rid of the monarchist agendas. I think it’s a drive toward democracy. EGNER It’s also a pretty explicit critique of tribalism. It’s driven by these cycles of revenge, these cycles of violence. It is house against house, somebody ends up with their head cut off and then that person’s offspring wants revenge on the other family, and so on. There’s a supposition that the show is about who ends up on the Iron Throne, but at the same time, the Iron Throne itself is this symbol of all of this terribly toxic violence. So I don’t think that really is the ultimate answer of this show. In fact, if I had to put money on it, I don’t think the Iron Throne itself will survive the show. I don’t think you can watch some of the awfulness we’ve watched over the past eight years, and then say, “O.K. Jon, now you get to sit in this thing that is the source of all of that strife and terribleness.” So I think the whole Iron Throne pursuit is almost a red herring, in a way. VINEYARD Even that whole thing of calling Jon the true heir is kind of a red herring — the Targaryen line was removed because the Mad King was murdering people for no reason, and no monarch should have the ability. So their first move was just to put in another monarch, but I think eventually they’re going to start to realize that they need to have some other system of rule. What has Dany done with Meereen and Slaver’s Bay since she’s gone? Or now Dragon’s Bay? She left a council, or other people, to rule. And Tyrion’s been bringing this up to her, the whole question of succession. The Night’s Watch has a system, the Iron Islands has a system. There are other systems to rule that maybe they could start to consider, so it doesn’t have to necessarily be a king and a queen just perpetuating a system that is broken. Previous articleA Chicago man ran the Boston Marathon with a cow heart valve 11 weeks after open-heart surgery. 13 years later, he’s running for another milestone.